Have you ever watched a child stare endlessly at one particular spot - maybe the light dancing on the wall at bath time, or his own hand moving back and forth, back and forth, as he waves for the first time? Maybe you thought your child was 'just' stimming; maybe you feared there was nothing going on in his mind. Maybe you just wondered what he was thinking. Maybe you knew that he was observing and learning about his world; making observations that would serve him for the rest of his life. It took me years to see that my son's endlessly boring (to me, who couldn't take the time to join him) observations were in fact the foundation of his lifelong interest in physics. He was learning - and only because he wanted to! I think we all need to tap into that beautiful experience of explorative wonder. I've been thinking a lot lately about how we have had free-range exploration and wonder trained out of us by the education, social, and employment systems we live in, and how poor we are to have lost this innate learning ability. Observation is essential for learning, and it's time we get back in the rhythm of it. So I've come up with an exercise for all ages. Kids do it naturally. Some of us may need some encouragement. I'm going to call this exercise Square Foot Observing. Yes this is a play on square foot gardening, but it's also a form of meditation - a meditation that requires nothing more than a brief commitment. Say ten minutes, though you may be forgiven for getting so deeply engaged that you stay for hours. Find a spot on the ground or near to it. One square foot. That is all. It doesn't matter what is in it. Lie down, so your eyes are a maximum distance of one foot from the spot you chose. Make yourself comfortable. You can even bring a mat or a pillow if you need it. That's it! Next time pick a different spot. You're giving yourself an opportunity to relax, and your mind an opportunity to focus and explore. In limiting your field of observation to one square foot you not only relieve yourself of the masses of overwhelming or distracting other experiences around you, but you also give yourself freedom to see more deeply. You give yourself an opportunity to notice things you may never have seen before, and there are such discoveries to be made anywhere, from a square foot of the most boring-looking piece of sidewalk to a square foot of laundry, to a square foot of lawn, to a square foot of forest floor or lake surface. What you are seeing may involve other life forms, but it may also involve interesting molecular structures, light play, soundscapes, or textures. Maybe the movement of the air or the perceived humidity is the thing. You can't know until you lie down and start your observation. Once you've been doing this for a while, and if you're not too much of a purist, you might want to bring along a little jeweler's scope to aid in your observations. These things can be quite inexpensive to buy, and can open you up to a whole new world of rarely-seen life and physical wonders. All of the photos included here were taken by my son Taliesin, who has always taken time to observe deeply, sometimes with camera in hand. This past May, my daughter had a big fall, goring her knee on a rotten branch. She endured not only a week of emergency room IV for the ensuing infection, but then three months of the wound slowly expelling all the remaining bits of rotten wood. Plantain to the rescue! Yes – seriously! What the salt water soaks didn't pull out, we got out with plantain poultices. Grab a leaf, chew it up, and place it on the (closed) wound. You can even use one of the flat leaves as a bandage to hold it in place (tied with string). 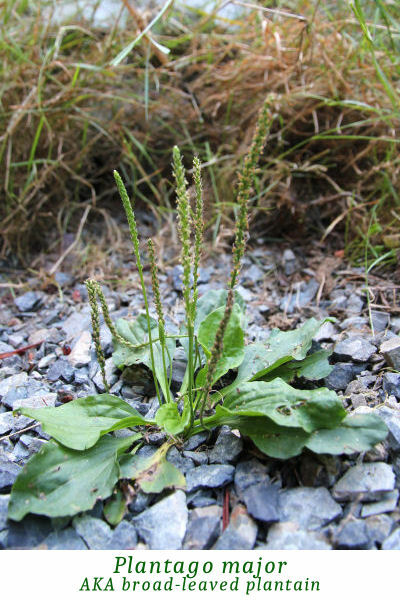 Not to be confused with plantain bananas, the small green inconspicuous plants of the Plantago family are exceedingly common. Find them along the edges of roads, meadows, lawns, paths, and playgrounds. 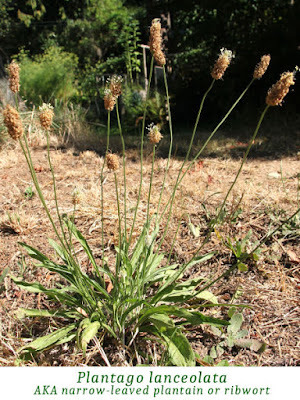 Most common around here are P. major (broad-leaved plantain) and P. lanceolata (narrow-leaved plantain or ribwort). Maybe when you were a child you learned to pluck a broad-leaved plantain and find the veins sticking out where you tore it off. Maybe you discovered that if you pulled those veins you could make the leaf curl up. Apparently some people have used these tough fibres as thread! When I was a little girl, my mother and I sometimes made the long gruelling climb from our home in Bowen Bay up towards Adams Rd. And along the way we saw ribwort, although we didn't know it at the time. We called them the Crowned Princes and Princesses of Denmark, because of their flowers' beautiful crown-like flower-heads. Oh the adventures those crowned princes and princesses have had over the two generations this game has persisted! Plantain is a wonderful entertainment system for kids on otherwise boring walks. 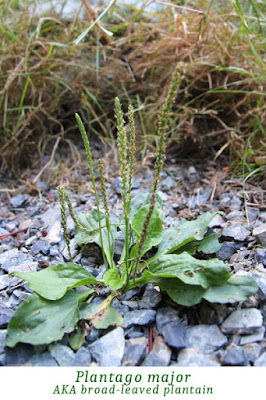 Food is maybe the least exciting thing about plantain, since it's basically a plain-tasting leaf that gets tough very early in its life. But if you get stoked about the prospect of eating food out of your lawn or healing and nourishing your body naturally, plantain is definitely for you. As with so many wild greens, the young leaves are great in salads, or braised as they grow tougher. They're also delicious in green smoothies – especially with the knowledge of all those nutrients you're consuming! 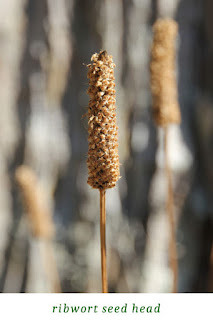 And if you are eating a grain-free diet, you may already buy the mucilaginous psyllium as a binder for coconut flour confections, or perhaps you use it simply as a dietary fibre. Either way, find it growing atop a humble plantain. Commercial psyllium seed actually comes from P. afra, ovata, or indica, but seeds of ribwort also have mucilaginous properties. 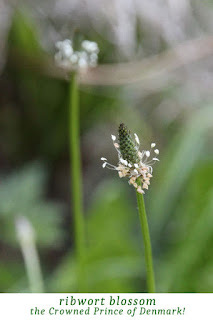 Find some ribwort blossoms that have fully gone to seed, rub the seeds out into a small bowl, blow off most of the separated husks (some remaining is fine) and add a bit of water. 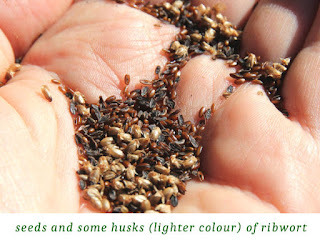 After a while you'll see the mucilage forming around the seeds. The mucilage is, of course, the same colour as the water, so it is only apparent in that the seeds sit increasingly distant from each other in the water, held separated by their growing coating of mucilage. When there's enough of it you can feel its gooeyness. But let's get down to business. Everybody needs some inspiration to try plantain, so I recommend starting with this lovely green plantain smoothie: Pick a bunch of youngish plantain leaves (either broad-leaved or ribwort will do), wash them, check for unwanted bits, and stuff them in your blender. Cover them with ice cold water (and a few ice cubes if your blender can handle it! ), and add some fresh lemon juice. Blend until the leaves are fully macerated and suspended in the water. If you want it sweet (like lemonade!) then blend in a little honey, to taste. If you want it creamy, blend in an avocado or some nut-milk. Enjoy! Today while looking for an email (and sorting by sender), I happened upon emails from my Dad, who died a year and a half ago. It's like seeing his ghost. I have lost an incredible amount of family recently, and am still feeling lost and stunned, so reading his words was comforting and surreal and confusing. He had emailed me about a blog post I'd written about him (6 years ago on my previous blog), so I went to read that blog post, and am sharing it here. In light of having lost the man whose story inspired it in the meantime, it is still meaningful to me. He's dead now. Even the toy store he owned all my life has been sold and changed. But this post, and his emails, feels like finding a piece of his voice from the past to help me get through the present. Many years ago, now, my Dad told me he had given notice on his toy shop’s rental space. He couldn’t afford to rent as much space as the new landlord wanted him to, and the landlord wouldn’t rent him any less. He gave notice before he had secured another location. He had to be out by the end of the month. The month was December – December in the toy business. There was no time to be out looking for a new location, and not many spaces were becoming available at that time, either. On a visit with my Dad, I asked him how the search was going. If my memory is trustworthy, it was about 10 days before Christmas. He replied that, well, he was hoping for Edgemont, but he was also considering Westview, since those were neighbourhoods he liked, and both closer to his home. Edgemont has about 50 shops, and Westview maybe 15. Ummm… but he was looking elsewhere, too, right? I mean… it’s highly unlikely he’d find something in one of those tiny shopping areas, on such short notice and … NOW. Well, surely he’d booked storage for all his stock, then, hadn’t he? Nope. He was going to move to Edgemont. Oh God – not this again. My father is a Baptist, and I am not. He would say don’t take the Lord’s name in vain. I do not believe in God. I would not put the future of my tiny toystore and all my life’s effort at risk just because I’ve decided I want something far out of my grasp, and then trust in God to provide it. Had I ever heard of the Mount of Olives? …the mountain where Jesus provided the people, bla bla bla… The people had faith and Jesus provided. It was a lovely story – really. Just not in my faith-book. My Dad said he had faith, too. Three days or so before Christmas I phoned to see how my Dad’s search was going, and to offer to help him arrange storage. He seemed to have found something, exactly where he wanted on the main street in Edgemont, but it wouldn’t be available until March. The day before Christmas my Dad was clearing some snow from in front of his shop, and the neighbour – a man who Daddy had previously helped – came to ask how his search was going, and to offer him his empty warehouse for the lag time between leaving the old store and moving into the new one. Problem solved. My Dad had faith and Jesus provided. Or somebody did. I still don’t believe in God, but I do believe in faith. We just watched Miracle on 34th street, and I was struck by the significance of the “in God we trust” plot twist (the lawyer convinces the judge that Santa is real in the same way that God is real; invisible though he may be, millions of people put their faith in him, and if we lost that faith the fabric of our society would disintegrate). It doesn’t have to be God or Santa or the Easter Bunny; not even fairies or the Central Bank or love; it can simply be faith itself. I absolutely could not stand the movie “the Secret”. I found it shallow and stupid, but at its core it was about having faith. Numerous studies have shown that people who have prayer – whether by themselves or by other people they are unaware of – heal faster on average than those who don’t receive prayer. Obama won with a slogan of pure faith: Yes We Can! It doesn’t matter how or why or even what; we just trust that we can. The magic is not in the entity or power that is believed in; it’s in the belief itself. I believe in wishing. When I was in grade 5 I went on a class trip to the Flying U Ranch. My class took the water taxi off Bowen Island in the early morning, and I wished fervently upon Venus that the boy I loved would ask me out. I wished and wished and wished with all the faith I had until I could no longer see the star, and then I wished the same thing in every tunnel we entered on our trip up the Fraser Canyon to the ranch. Not only was I one of the least popular girls in my class, always the last picked for teams, only 10 years old, and absolutely terrified to talk to the boy in question, but he was by far the most popular boy, doted on by every girl, and in no way desperate for a date. Girls had fist-fights over him, and yet none of us dated anybody, yet. Those wishes were prayers. On the last day of our class trip, there was a dance. I dreaded parties. I went to my cabin and sobbed the evening away while everybody else danced. Actually I was lying on the bed, drawing a very miserable picture of everybody else dancing, and myself crying. I still have it. It’s half finished. There is a funny-looking line where the pencil slipped when I suddenly stopped drawing. Knock at the door. … Yes? … Emily? Of course it was him – I was so shocked I fell off my bed and onto the floor, and, as I stumbled up to my feet in front of him, he asked me to dance with him. In hindsight, it doesn’t matter whether my teacher encouraged him to ask me, or whether he came to my cabin out of pure true love. That night not only my faith in wishes was bolstered, but my faith in a world that sometimes seemed to have abandoned me. I have spent most of my life trying to build up the courage to like myself; to have faith in myself and my ability to just be good enough. In my head I know that it’s all in my head. But it’s only faith that can make that leap for me. My Mum and Pappa taught me atheism, but they also taught me faith. They put faith in the land and fed us. They put faith in their own ability to create a life together, and a beautiful home out of a piece of forest. It wasn’t easy, but they had faith and they prevailed. They put faith in love to lead us through our differences, and faith in me, recently, when they bought me an etching press for a career they can hardly fathom. We put faith in the vast universe, every day, when we leave our loved ones and our dreams and trust that we’ll find them again. Our faith is broken, sometimes. It has to be. But it's also what allows us to carry on. Faith goes on. Right now my Dad is recovering from surgery after a fall that cracked his spine. His God sure hasn’t given him an easy row to hoe, but he is stalwart in his faith, just like he’s stalwart in his refusal to use a walker, much to my fear and dismay. His Parkinson’s seems, if anything, to have deepened his faith in his God. I guess God is there when you need him, just like parents, stars, love and Santa Claus. I still don’t believe in God, but I believe in faith.